Many people believe that when you decide to semi-freeform your locs, that you can neglect them and be rewarded with thickness. That is NOT the case. 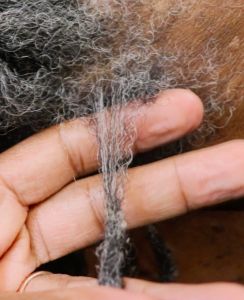 Semi-Freeforming your locs is a technique, not to be confused with carelessness. And like many of the techniques available for locking your hair, semi-freeforming isn’t for everyone. 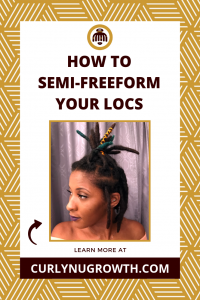 Let’s explore what is really means to “semi-freeform” locs and find out what is takes to semi-freeform your locs properly! Semi-Freeform is a technique for locs exclusively maintained with palm-rolling that blends the art of freeforming, or allowing your locs to grow organically without any manipulation, and the regimented loc maintenance technique that defines your parting system, loc size and shape. As a Loctician, I encounter the semi-freeform technique causing major damage to locs when people attempt to semi-freeform their locs for the wrong reasons or they do it at the wrong time in their loc journey. One of the most common problems that is often consistent with the semi-freeform technique being used improperly is thinning. I personally attribute the issue of thinning and semi-freeforming to the internet/Youtube. So often I see people post about their locs thinning at the roots and the overwhelming response is to “leave it alone” then 3 months later they wonder why the loc is hanging on by a thread or has completely broken off. PSA: If your locs are thinning at the roots, you should NOT semi-freeform; it will cause more damage. 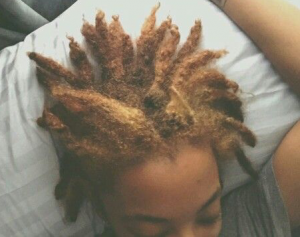 To actually be successful in cultivating locs using the semi-freeform technique you should adhere to the 5 principles of semi-freeforming. 1. Commit to minimal styling and/or tension. Even pulling your locs up into a ponytail often can be problematic when semi-freeforming. Due to the fact that the root of your locs are loose and not bound into the common cylindrical shape of locs, you risk causing your locs to become flat and/or slowing down the locking process. 2. Cleanse your hair regularly. It is important to have clean hair when semi-freeforming to prevent excessive weight from product buildup or environmental impurities. If your locs have an accumulation of buildup it will cause the roots to thin, especially with semi-freeform locs. 3. Separate Your Roots. You have to ensure that you maintain your parting system and that your locs do not fuse together while semi-freeforming and you do that by “popping your locs” at least once a week. 4. Self-Grooming. Everytime you shampoo your locs, you have to do light grooming to maintain the shape and integrity of your locs. A few techniques for self-grooming semi-freeform locs are “Loc Rubbing” and “Base Wrapping”. 5. Protect your hair. Always wear a satin scarf to bed or whenever you are lounging around the house to minimize lint and environmental debris from embedding in your locs. I believe “Rule #4 to be the most important guideline to follow and the one that is often overlooked. However, if you stick to using all of these guidelines when you semi-freeform your locs it will help you to avoid the common mistakes with semi-freeforming such as thinning and breakage. And of course, you have to make sure that you are hydrating your locs and using products that nourish the hair and scalp because again, semi-freefrom does NOT mean neglect! How is your experience with Semi-Freeforming? I’m 5 years into my loc journey and although I self-maintain “traditional” locs I still find useful information on caring for my hair and scalp. Thank you very much. I appreciate you taking the time to read and comment! Sending you lots of love on your journey! I’ve been locing since 2011. I’m over 55 years of age I normally have very very thick hair and I do my loc’s myself since to beginning and I’ve noticed I have a lot of thinness throughout my hair and its gray. I hope that you are able to find healing for the thinning that you are experiencing. 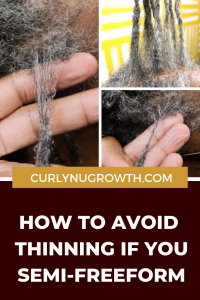 Unfortunately I do not have a recommendation in California but I would suggest reading this article, “Causes of Thinning Locs“, and seek a Trichologist in your area. 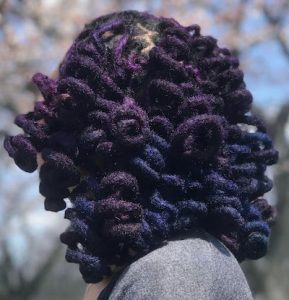 I now consider myself a semi-freeformer because I don’t do a lot of “styling” to my locs – I wash regularly, palm roll, and have set them on rods, but between that activity (once a month or so depending on growth), I don’t manipulate them much at all. I moisturize them, sleep with a silk or satin scarf ALWAYS, and they are generally left to brush my shoulders (or lay on my shoulders for the longer ones). 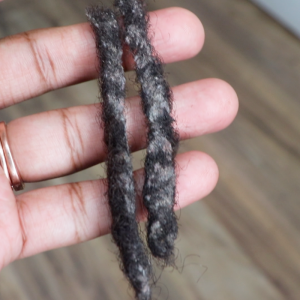 I brush my locs a couple of times a week (love doing this) and I’ve noticed less frizziness after brushing. Love your regimen! Brushing my locs feels so good as well! The less manipulation the better! Thank you for sharing. thod. That I think would be so much better for me. Thank you!!!!! Thank you so much for your compliment! 🙂 I agree that you should discontinue having your hair snatched with each session. Try to find another Loctician in your area or learn to maintain your locs yourself. Thank you so much for taking time out to teach us! I am nearly to my 3th year journey….and still struggling! My hair is totally gray ( I am embracing them)… My new hair tends to grow away from the locs and constantly I have my hands in my hair! !… I have done interlocking myself but it gives me a burning feeling on my head… maybe I should let them be… For moisterizeing I use water ,olive oil and coconut oil… so far so good! Thanks again!